The alto saxophone can be smooth or strident, cool or funky. It can whisper or wail, honk or caress the senses. Legendary Charlie Parker played the alto sax. Counting Parker among his influences, young lion Jaleel Shaw plays it these days. On Friday and Saturday, March 7 and 8, Shaw will have top billing at the Artists' Quarter in St. Paul. These dates fall midway between his 30th birthday (Feb. 11) and the release of his second CD as a leader (March 18). Shaw says he's happy to return to the AQ, a club he has played twice before. "The thing that's great about the AQ is the fact they were willing to bring me in as a young artist," he tells me in a phone interview. "Not many clubs are doing that anymore — bringing in musicians from New York, giving us opportunities to play." Born in Philadelphia, Shaw grew up hearing jazz records played by his mother, Olivia. He started playing the alto sax at age 9 when she nixed his first two choices — trumpet and drums. His education as a jazz cub included music schools, jazz camps, mentoring by local musicians like Grover Washington Jr., and playing in a youth jazz band led by Lovett Hines, who counts Christian McBride and Joey DeFrancesco among his former students. He won a full scholarship to the Berklee College of Music in Boston, where he earned dual degrees in music education and performance and a trunk full of awards. 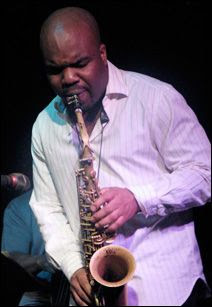 From there he went to the Manhattan School of Music, again on scholarship, and graduated with a master's in performance in 2002, the same year he was a finalist in the Thelonious Monk International Saxophone Competition. He taught at Temple University for three years. Today, Shaw calls himself a freelance jazz musician, but he has gigs that are probably the envy of many young artists. He's a member of both the Mingus Big Band and, since 2005, the Roy Haynes Quartet, with whom he will play at the Ted Mann. What is it like to play with Roy Haynes? "Amazing," Shaw says. "It's an honor and a blessing to play with one of the masters of the music. He's played with everyone from Louis Armstrong to Charlie Parker to John Coltrane. Those styles are ingrained in his style, and he continues to grow. He doesn't let those styles hold him back, but you can hear that he's rooted. That's one thing I want to incorporate into my playing. Stay rooted, always have that tradition, always have that sense of future." At the AQ, Shaw will be backed by a trio of top area musicians and AQ stalwarts: pianist Chris Lomheim, bassist Billy Peterson and Horst. Shaw didn't know who would be joining him on the AQ stage until I told him. It's not uncommon for jazz musicians to perform with complete strangers. "Usually when I go on the road and play different cities," Shaw says, "I play with whoever's in town. Honestly, even in New York [where Shaw now lives] I'm not always able to have the cats I want." This is one reason live jazz is so exciting — the fact that the music is truly in the moment and you never really know what you will hear until you hear it. Shaw and his AQ trio will likely play songs from his new CD, the aptly named "Optimism." Its predecessor, "Perspective" (2005), was voted one of the top five debut jazz albums of 2005 by the All About Jazz website and "Jazzwise" magazine. The opening track won Shaw the ASCAP Foundation Young Jazz Composer Award. Shaw recently learned that the opening track of "Optimism" has received the same honor. The new CD features nine originals and two standards including Cole Porter's "Love for Sale." Although it's not officially out yet, copies will be available at the Ted Mann and the AQ. Shaw is especially proud of this CD, the first release on his new label, Changu Records. He wrote most of the music, including a couple of tunes the night before going into the studio. How much: $29 and $37. Irv Williams CD Release: The sounds of Mr. Smooth, the fun of a CD release for a disc he called "Finality." Yeah, right, Irv. The Artists' Quarter, 9 p.m. Friday, Feb. 29 and Saturday, March 1 ($10). Ellen Lease/Pat Moriarty Jazz Quintet CD Release: I've never heard this group but there are at least five good reasons to go: 1) Their CD, "Chance, Love & Logic," is on the Innova label. 2) The CD release will be held at Studio Z in Lowertown. 3) Kelly Rossum will play his trumpet. 4) Chris Bates will play his bass. 5) Brains will be engaged. 8 p.m. Saturday, March 1 ($10). Twin Cities Winter Jazz Fest. A whole day of jazz in the sparkly new MacPhail Center for Music. Read all about it. Noon to 8:30 p.m. Sunday, March 2 ($15/$25).